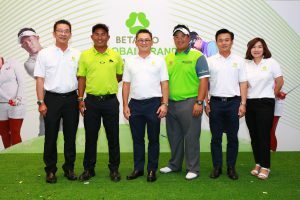 BETAGRO Group beefs up Thai golf team, signing professional golfer Kiradech, Arm, Aphibarnrat as the latest BETAGRO Global Brand Ambassador aiming to conquering golf tournaments worldwide. To increase the capacity of Thai golf team, BETAGRO Group recently appointed Kiradech Aphibarnrat, a professional golfer, the latest member of the Global Brand Ambassador Team led by a professional golfer Thongchai Jaidee and the Jutanugarn sisters – Moriya or Mo, and Ariya or May. They are practicing to get ready to claim victory in global tournaments, rewriting a new history for Thai golf. Mr. Vasit Taepaisitphongse, President of BETAGRO Group, revealed that after the first launch of the Global Brand Ambassador Team seven years ago, BETAGRO Group has become better-known among entrepreneurs and consumers in Thai and international market. The next step of BETAGRO is to tap the global market by expanding BETAGRO’s consumer steadily while maintaining product quality. This is the goal that the Global Brand Ambassador Team and BETAGRO share, to become an organization with Commitment, Integrity, Professionalism, Goal-orientedness, and Quality-driven. This year BETAGRO Group selects Kiradech Aphibarnrat also known as Arm, a professional golfer, as a new member of BETAGRO’s dream team. “Arm” is the youngest Asian golfer to have won the European Tour up to three tournaments, ranking in the top 56 in the world and the second highest in Thailand. As the fourth Global Brand Ambassador for BETAGRO Group, Mr. Aphibarnrat is recognized for his ardent commitment to the development of his skills and the quality of his performance. His progress takes a long stride, leaping from a young amateur when he first competed in 2003 to a professional player when he attended the international professional tournament in 2009. His athletic genius shines even more brightly at recent global competition by winning the European Tour, Maybank Malaysia Open 2013, Shenzhen International in 2015, and Saltire Energy Paul Lawrie Match Play in 2015. Joining the Global Brand Ambassador Team, Kiradech has officially become BETAGRO’s fourth world-class golfer. The four golfers include 3 professional golfers: Thongchai Jaidee, known within Thai golf circle as Pro Chang, and two female golfers, Moriya and Ariya Jutanugarn also known as Pro Mo and Pro May respectively. BETAGRO Group believes that having the best golfers in the family of the Global Brand Ambassador team will create a powerful and encouraging atmosphere among Thai golfers and enthusiasts. This addition of the new member will spark a great interest in this sport, igniting the exchange of ideas and techniques to energize Thai golfers to compete with quality which eventually will lead to the new era of the golf society in Thailand.